The idea is simple: data on the iButton is used to generate simulated keystrokes. I type half of the password, and the iButton ‘types’ the rest. In my proof-of-concept, the text generated by the iButton is derived from its ID, which undergoes some secret modification before it is written. I’ve got enough ID-only iButtons to let me change them every time my password expires for the next several years. I also have some with EEPROM and other forms of memory, so a future version might use that. The guts of my prototype are a miniature knock-off of an Arduino Leonardo (based on an ATMega 32U4). The reader itself is ‘dumb,’ not much more than two concentric rings of stainless steel with a decorative LED in the middle. The sleek enclosure was something hanging around the office, left over from an old project. 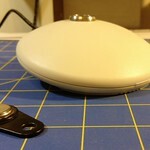 A piezo speaker indicates a good or bad read. All in all, it’s pretty good for a single evening’s work, using parts I had on hand. Writing the code was easier than I’d anticipated. The Arduino OneWire library works better than expected. // Pins. 1-Wire data, LED, and speaker. // reader is idle, as made popular by Apple products. // iButton reader status and interval check. // operation. Removing the jumper puts the board in 'debug' mode. // Reverse fade direction if it's hit min/max. // See if it's time to attempt reading the iButton. // Only process if the touch is 'new,' not the same one. // Prevents repeatedly sending the ID. // slightly more pleasant than a beep. // will have been generated by a new iButton touch. // Debug mode: just print the ID to the Serial console. // Normal operation: send ID as keystrokes. // but I'm keeping the details secret. This was just a proof-of-concept, not something I’m intending to use, at least not in its current form. Any of my coworkers seeing this can rest easy. It works remarkably well, though, so I may actually use a future iteration. No schematics for this yet, but it’s all pretty simple. Will update at some point.